Every shop has a selection of permanent fixtures. Not the cash register or the window dummy but those stock items that sit. Then get dusted. Then sit some more. Bentleigh Sounds, the record and electrical goods store where I worked for a good part of the 70s and early 80s was no exception. Although I could regale you with stories of my struggles to sell hot rollers (nothing to do with babes on skates, I assure you) or the existential piquancy of a bearded youth extolling the virtues of a new model of electric razor, it is to the music section that we turn. One of my tasks was to periodically leaf through the LP racks and return albums to the correct alphabetical order. If you are wondering why this seemingly obsessive task was necessary then all I can say is, you’ve never worked in a shop. This will shock the responsible and thoughtful readers of Vinyl Connection to the core but I have to tell you that most customers seem utterly incapable of returning items to where they were found. Perhaps it’s absent mindedness. Maybe the momentary thrill of having servants to clear up after you. Who knows? Suffice to say that my training in alphabetizing records remains so deeply ingrained that to this day I re-file incorrectly placed albums while browsing in my favourite music stores. Familiarity with the stock is a direct result of the filing and re-ordering process, and some records became very familiar indeed. They were there when I first started work and they were still there later. Years later. Big stores deal with this inevitable accumulation of ‘sluggish’ stock by having regular slug sales but this seems not to be the rule for small businesses. What should happen is a regular purge of the unwanted, the overlooked and the underrated, a ritual annual cleansing of the shelves. (I hope you are noticing the deep irony of a hopeless accumulator lecturing on the joys of purging, by the way). What actually happens is that dead stock just sits there. Dead. 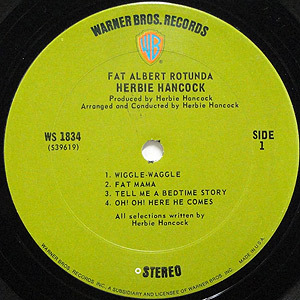 One such record was Fat Albert Rotunda by Herbie Hancock. Having been released in 1969, it was already slightly discoloured and exhibiting a tell-tale slumping of the corners when I first flicked past it during my ‘familiarization’ phase in the shop, around Christmas ’73. I recall being puzzled by both name and cover. Who is Fat Albert? Obviously he is a rotund person. Perhaps that is why there is a refrigerator full of food on the cover. But it is very healthy food, fresh vegies and the like. Is this a dietary hint to Albert? Then there is the strange industrial birthday cake on top of the ‘fridge. What’s that all about? The back cover is no less obtuse. A long poem by someone called Peter A. Redstone. It is about a runner and is quite engaging but what has it to do with Fat Albert? Is it part of his fitness program? How does it relate to the music? Eh! Too many questions, too little time. Anyway, here is a Jethro Tull album lost in the H’s. And Downbeat didn’t stop there, continuing waspishly, “Music is what Hancock produced until this LP. Therefore, let us hope that this album is a minor derailment.” Ouch! Maybe I’m a sucker for aligning with the underdog, but I recently bought a vinyl re-issue of the album and I like it. A lot. After a brief preamble that has a bit of sitar and muted trumpet (a wave goodbye to Miles?) ‘Wiggle Waggle’ opens the set with a bright soul funk groove. Horn stabs shout ‘Hallelujah!’ and Herbie’s first electric piano solo rolls and boogies. If you love the sound of the Fender Rhodes – and I most certainly do – you will light up with the next piece, ‘Fat Mama’. It’s another funky shuffle with horn punctuation though this time the brass guys are a half-pace back. As I sway and nod along I think of Eumir Deodato. Remember him? He had a huge hit (in some territories) with his funky arrangement of Wagner’s ‘Also Sprach Zarathustra’ (aka ‘Theme from 2001’) in 1973. The pianist/composer moved from Brazil to the USA in 1967 and I reckon he must have used this album as a template. And I mean that in a most complimentary way. Next up is a ballad, the pretty ‘Tell Me A Bedtime Story’. It has a bossa nova swing and a sensitive melodic flow. Side One is rounded out by another horn driven funk workout. ‘Oh! Oh! 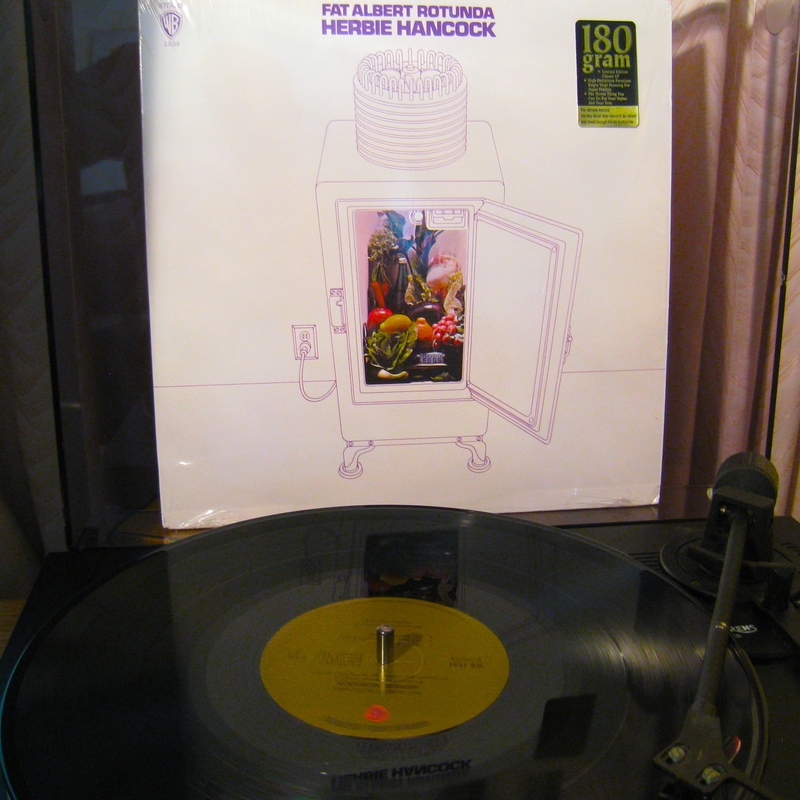 Here He Comes’ has a swagger to it’s funky shuffle, with conversations between the horns while Herbie’s piano lopes along. If you can remain immobile during this, Jack you’re dead. ‘Jessica’, the haunting ballad that opens Side Two, is given initial voice by the flugel horn of Johnny Coles before his horn brothers add lines and textures and the melody eventually emerges with the leader, this time on acoustic piano. It is very pretty in a melancholy way. Can’t imagine why it has not become a standard. Look out! Here comes the title track! HH is comping with Rhodes chords, Buster Williams bouncing on a fatback bass line. Guest Eric Gale smacks some pure funk rhythm guitar and HH solos over the top then leaves space for Joe Henderson to have a wail on tenor. Things are cookin’ in this rotunda, baby. Last song is ‘Lil’ Brother’. Those brassy brass guys open proceedings at a fast shuffle. Eric Gale gets a moment before returning to rhythm then bursts back into the room with another solo that sounds like underwater wah-wah guitar. It is a weird but not unpleasing sound. Short punchy solos from Henderson and Hancock add further spice. The horns have a Bullit car chase urgency so that when they fade at the end you’re almost puffed. This is an engaging album: energetic, funky and playful but with moments of beautiful reflection. The major criticism is that it’s all over far too soon, in a shade under 34 minutes. Remember the response at the time? Five stars for the preceding The Prisoner and a mere two for Fat Albert Rotunda. Well Allmusic guide gives the former three stars and Fat Albert four-and-a-half. It seems that some things do improve with age. I don’t know why no-one bought the album in the shop back then, but I’m well pleased with my purchase. Actually, for the first 8 years it was called “Max Rose Electronics”. We sold the Mobile Fidelity Records that were reissues of classic albums redone as half speed masters for better sound quality. One of the reissues was Steely Dan’s “Katy Lied” of which we had two copies of for years. ‘Katy Lied’ is an excellent album. And a worthy contender for a post! I must listen to this; you make it sound so good. Thanks for another lead. Yes, it’s a fine album. It had my mobile phone running hot (but mainly because the signal for beaming in music is so weak in Ballina). And even Z was boppin’ along. Head Hunters and Maiden Voyage got a run yesterday – albums I have ignored for a while. Herbie is back in favour. It has something to do with place, mood and the very clean if not too bassy sound of the Pioneer Bluetooth I take on holiday with me. And perhaps recollection of your fine blog. Thanks Bruce. I imagine almost anything might be enhance by a beautiful setting, DD. But that is a fine selection of HH to be sure. Great post, as always – I’d have bought it for the cover and title alone. I can just see the stacks of hot rollers and electric razors, the yellowing record covers, the customers carelessly, haphazardly stuffing records into any empty space, ignoring poor old Fat Albert year after year. Ha! I love Eumir Deodato! I’ve recently been going through a CTI Records fix and was over the moon excited with his version of Also Sprach Zarathustra. Great post! That’s great. Some folk – especially jazz seriousos – turn up their noses at Deodato. But I love those early albums, particularly the first. And like you I treasure the CTI releases I own. Love the covers! “Who is Fat Albert? Obviously he is a rotund person. Perhaps that is why there is a refrigerator full of food on the cover. ” Love this! 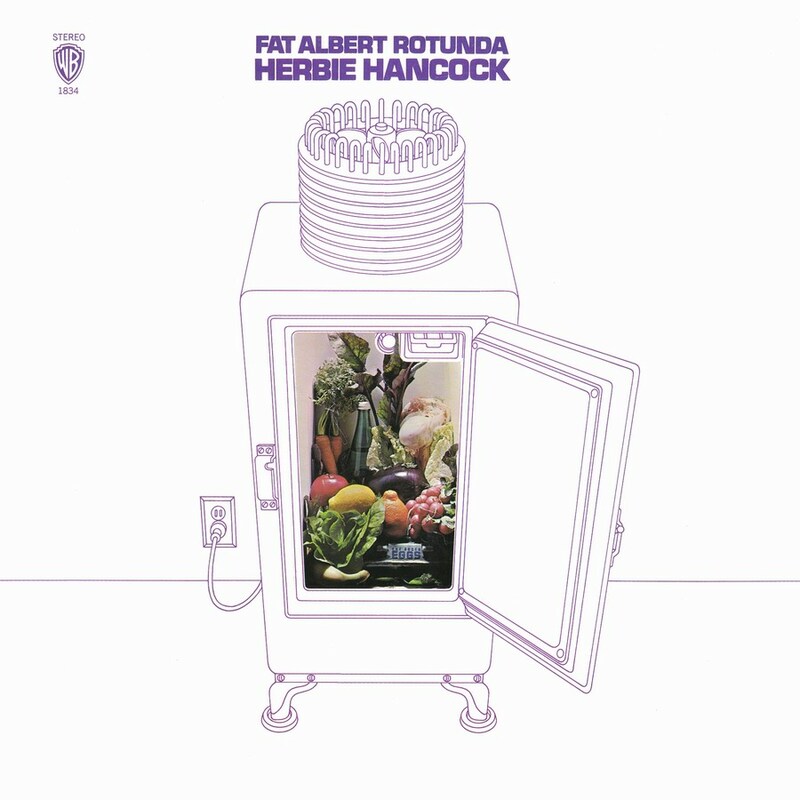 Fat Albert Rotunda is an all-out funk classic. Downbeat in the late 60s was filled with jazz snobs that couldn’t get their head around the funk/fusion storm that was to come. From this point Hancock became the innovator. 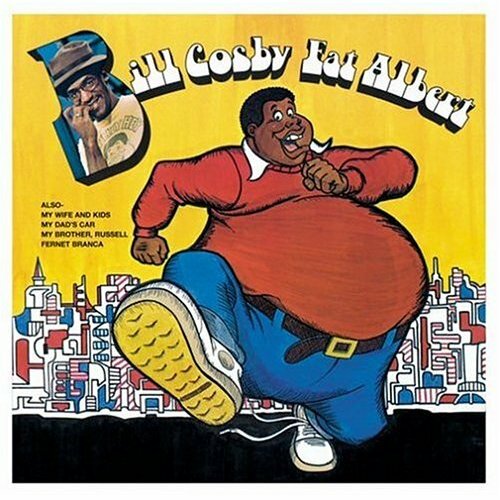 Fat Albert was a Bill Cosby character (you can see a little pic of an LP at the bottom of the post). I used to watch the Bill Cosby “Fat Albert” cartoon regularly as a kid. Little did I know the original pilot special was soundtracked by Herbie Hancock; I learn a lot as a result of your posts, VC. Wikipedia says a few of the songs on this album were reworked from the soundtrack. Reason enough to hear it methinks, even if just to see if it recalls to mind those Saturday mornings watching Fat Albert and his friends get in and out of tight spots. Hey Hey Hey! As a jazz toe-dipper only, ‘Rockit’ and that awesome music video will always be my HH touchstone. I’m not sure we ever had the cartoon show in Aus; my source of the ‘learning’ was probably Wiki too! ‘Rockit’ was fabulous, wasn’t it? Further, can I suggest that one afternoon when you are feeling decidedly funky, you give Headhunters a go?